In his report for Forrester, author Mark Mulligan talks about ‘Digital Natives’, 12-15 year olds who have no experience of a world where music was paid for in the way older people would understand - physical products, downloads or even subscription models. For Digital Natives, music is less about ownership and more about experience, access and connectivity. So if this group (and presumably those that follow) is listening to and enjoying music but not in the way the music industry has traditionally served it to them we’re in a position where we innovate or get left behind. Orange Monkey is a unique music mobile tariff that was developed with this sort of consumption in mind. Where I disagree with Mark Mulligan (Digital Natives: The Generation That Music Product Strategy Forgot) is that I believe that with a mix of the old and new consumption models there is still a rich and rewarding experience that is closer to ‘ownership’ than he might foresee. In a world of immediate and unlimited access, and devices literally in your hand or pocket at all times, the inclination to skip or move on can be hard to resist. But I believe there are ways of adding currency to a track, using other high quality digital assets to tell more of a story, which will make even the Digital Natives spend just that little bit more time with it. Video does this brilliantly, and confirms the value of creating engaging video content that may be centred around shared passions other than just music. I was reminded of the value of ‘the story’ recently when I watched a TV documentary about an artist I had no real interest in. I now have more than one of his albums. It would also be wrong to assume that our thoughts are focused solely on the young music fan, and what may not seem at first to be right on the cutting edge of thinking may in fact be innovative when applied to a particular group. A good example of this is the release of Take That’s album ‘Progress’ at the end of 2010. The band’s previous album release had a digital market share of 4% - unsurprising for their audience. But with what we consider a ground breaking partnership with iTunes which involved 18 months of carefully introducing their audience to the digital arena in a way that worked for them, and culminating in the first ever iTunes homepage takeover using bespoke content from the band and a great bundle offering, that digital share increased to 19% in release week. Innovation needs to be part of our thinking at every stage of what we do and while the music industry has a strong history of partnering with brands, this typically involves a brand partner paying for an association with music or a specific artist. But our partnerships must be more collaborative for our future success. 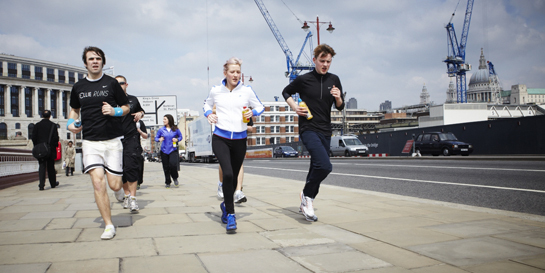 There are many opportunities to bring scale, expertise or a new audience among other things to our music offerings, as we found when we got together with Nike on our Ellie Runs campaign. We need to be open in our approach, and open in how we do the commercial deals to make these partnerships work in a way which will benefit our artists, music fans and the music industry the most. And innovation is not the only requirement for the music industry, it’s a bright vision of the future. For us here at Universal Music we see the rapidly developing digital world not only as a challenge, but as an exciting opportunity. Not many people can say (no matter what business they work in) that they were part of a truly ground-breaking, industry-shaping era. I think I am, love being a part of it and can’t wait to see it unfold. It’s not the end – it’s just the beginning.